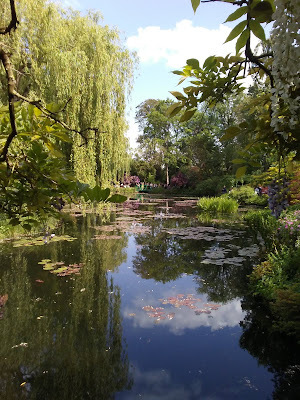 On a recent stay in Paris, my son and I took a side trip to Giverny, where Monet's home and gardens are located. Like many others, I have often dreamed of visiting the gardens where Monet spent most of his later years, creating the water lily paintings that have become so well-known and loved around the world. Even though our excursion turned into a bit of a nightmare, I was able to capture some lovely photos of this popular tourist destination. One of the famous lily ponds at Giverny. Getting to the gardens involves taking a train, then a bus, followed by a short walk. We chose a Monday for our excursion, hoping to avoid the weekend crowds, unaware that it was a French national holiday. 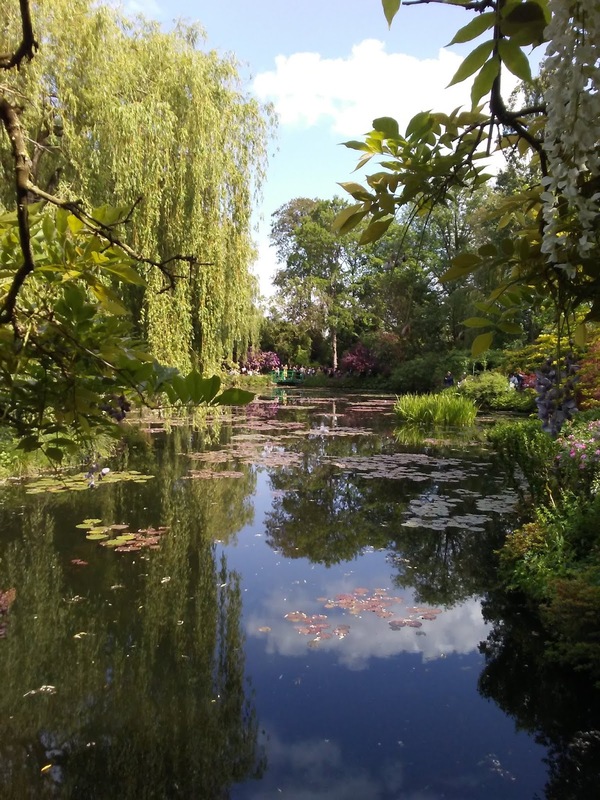 We had envisioned a day spent leisurely walking amidst the gardens and lily ponds of Monet's home. Instead, we found ourselves among hundreds of other tourists, including numerous French people on holiday. When we arrived at Gare St. Lazare in Paris at 9 a.m. to get the train to Vernon, we discovered that there were only a few trains running that day (due to the holiday and ongoing train strikes), and the earliest one wasn't until noon. Not only that, but the only return train from Vernon would be at 6 p.m., giving us a short time to enjoy the gardens. (It takes about an hour to get to Vernon, then another 20 minutes to get the bus from Vernon to Giverny....so travel time is at least 2 hours each way, considering wait times, etc.) Little did we know that other obstacles would intrude to shorten our time even more. Rather than stand around the train station for several hours, we walked over to Galleries Lafayette and Printemps, two Parisian malls that have magnificent stained glass domes at their center. I'll be sharing photos of them in another post. First view of Monet's garden. Once on the train, we were elated that the weather was perfect that day, with temps in the 70's, accompanied by blue skies and plump white clouds skittering around. Arriving in Vernon near 1 p.m. we quickly realized that most of the people on the train were also headed for Giverny, and four huge buses were lined up to transport all of us from the train station to the gardens. We were still in high spirits, though it took precious time to load everyone onto the buses. It's also possible to rent bikes in Vernon and bike to Giverny, and we might have gone that route if we'd had the entire day, as we had hoped. But given the shortened time frame, we joined the masses traveling by bus. Jesse walking towards the entrance to the gardens. Upon arriving in Giverny, we had another 10-minute walk from the parking lot to the garden entrance, where we discovered a line with hundreds of people waiting to get in. Thinking that the line would shorten after everyone from the buses was admitted, we opted to walk down the road to have lunch. We found a lovely restaurant with an outdoor terrace and feasted on galettes, though we ate quickly and weren't able to fully enjoy the meal or the view. In fact, I left Jesse there and returned to the line, hoping to save some time. Alas, the line was no shorter than when we had left it, and we ended up waiting nearly ninety minutes to gain admission to the gardens. People were admitted one at a time, as there was only one person selling admission tickets, so the going was very slow. We were getting anxious by then, considering that we had less than an hour to view the gardens and get back to the parking lot at 5:10 p.m. for the bus ride back to the train station. If we missed that bus, we would be stuck in the area overnight, with little chance of finding lodging in the already overbooked towns of Vernon and Giverny. We finally entered the gardens after 4 p.m. and made our way quickly through it, unable to stop and enjoy most of what we were seeing. Fortunately, many flowers were in bloom, and bursting with color and beauty all around us. The famous lily ponds were across a road, and we went through a tunnel under the road to reach them. With so many people, it created a bottleneck, slowing down the crowds to get everyone through. But it was certainly worth the wait! White wisteria blossoms covered one of the bridges, and the majestic weeping willows swayed over the lily ponds. In addition, the lighting was good for taking photos at that time of day. White wisteria covering a bridge. I have read numerous books about Monet's life at Giverny, and would have loved to have the chance to sit and savor the views of his gardens. I had hoped for a serene experience among the flowers, trees and lily ponds, instead of the rushed, Disneyland-type tourist event that we experienced. But at least we made it there! I know of others who visited during the early spring or fall when there were no crowds, but also no flowers in bloom, so we also lucked out in that respect. One of the lily ponds, with weeping willow. We didn't have time to see Monet's house or to peruse the goods in the gift shop. As it was, we got to the bus just in time to head back to the train station. And then the train was late...and since it was the last train to Paris that evening, the train station was quickly crowded with people hoping to take it. Since it was the end of a three-day weekend for the French, they added a considerable number to the crowds needing to return to Paris. We had to shove our way into the train, and Jesse and I ended up standing like sardines in the space between the train cars. But then, a miracle happened. After about 10 minutes, the glass door of the train car opened, and a woman motioned me in. Everyone was chattering in French, trying to tell me something. Me? I didn't understand why, but they were urging me to take a seat in the middle of the car, that a young man was giving up. I have ridden standing up on numerous trains and buses on my travels, and could have managed this one for the 60 minutes to Paris, but I guess I was the oldest person standing in that group, and welcomed the chance to sit down. I was so touched by the consideration of the French people, who waved me in and had to squeeze together while I passed by, that it brought tears to my eyes. Needless to say, I had a comfortable, pleasant return to Paris. I would definitely recommend this excursion to others, with the caveat that it's not wise to travel on a French national holiday or when there are train strikes. Plan to go when the flowers are blooming and make sure you will have at least 3-4 hours to enjoy the gardens and other areas of Monet's home.